Now is the time of the year you can make great savings buying on sale from the Cath Kidston website. Cath Kidston Fabric Sale is now on! 14 different oilcloth and cotton fabric patterns have been reduced by at least 25% so if you are planning to buy some lovely designer cotton fabric, then Cath Kidston fabric sale offers you a great opportunity to acquire some at a low cost! Click here. 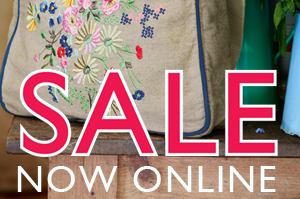 Cath Kidston Bag Sale is now on! With so many bags on sale and in different fabric patterns, there is no doubt that you will find a stylish Cath Kidston bag that suits your needs. From the Cinema Bag to the popular Summer Blossom Holdall, and bags for any budget! Click here. Cath Kidston Cushion Sale is now on! These fabric cushions can’t be found within the Decor & Furnishing category but they can be found when using the search box at the top of the Cath Kidston website. Sold for £40, the Electric Flowers Tapestry Cushion and the Spot Tapestry Cushion are now only £20 each. More affordable and great for kid’s bedrooms, the Transport & Mini Dot cushion is only £4.